This was a Bass with laminated ribs. The student's Father shut his rear deck-lid on top of the rib and it created a rather large hole with lots of shards of plywood. 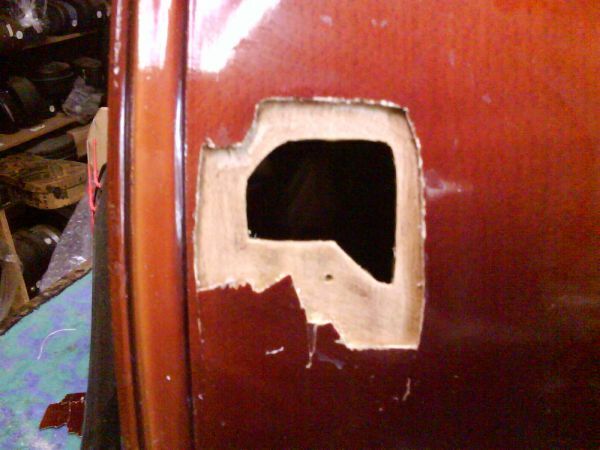 Since this was only a student bass it wasn't really cost effective to remove the top to just fix this hole in the rib. I wanted to fix this from the outside so here are some shots of several of the major steps involved. (1) The first step was piecing together all of the small pieces so that there was only a single piece that fit the hole. Since laminated wood breaks with lots of edge shards those pieces need to be trimmed and then carefully fitted together. (2) An interior patch is then fitted into the hole so that it covers the perimeter of the hole. This patch is made from maple that's about the same thickness as the rib. It's bent so that it has a matching curve. The center of the patch is removed so that it can be clamped from the outside. (3) Once the patch is fitted then it's just a matter of fitting the piece into the hole and then clamping the piece from the outside. (4) Some quick varnish touch-up and it's finished. This next bass had one large crack on the lower bout that went from block to block. 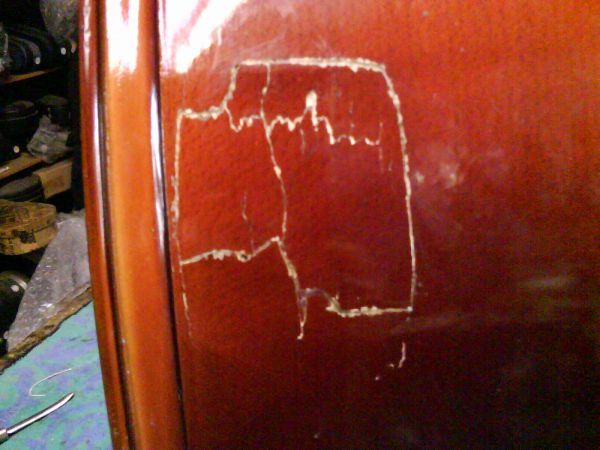 There were also several other cracks that were parallel to the main crack and some cracks near the c bout that went perpendicular to the grain. Is the interior patch a piece of thin wood. 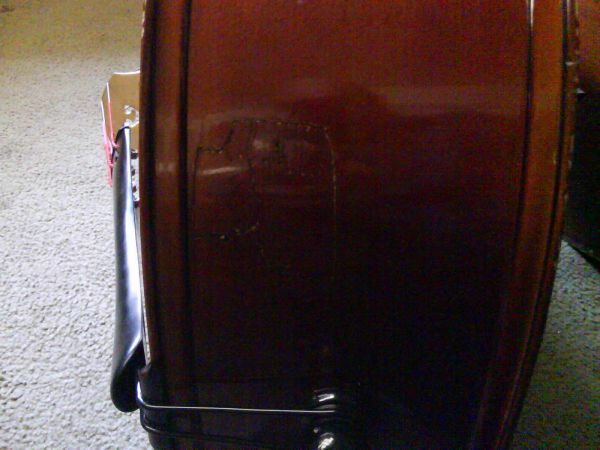 I have a cello has the same problem, want to re-install the pieces back. I added a little clarification to the procedure I used. 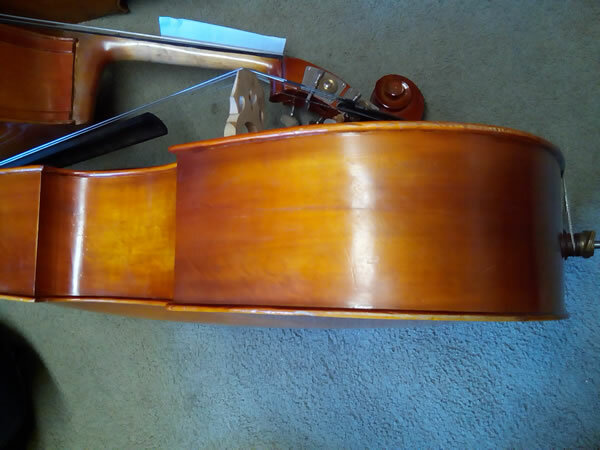 This repair is easier if you take the top off, but in this case I wanted to try and repair it from the outside, mostly as a chalenge and to save the customer some expense because taking a bass top off is time consuming. 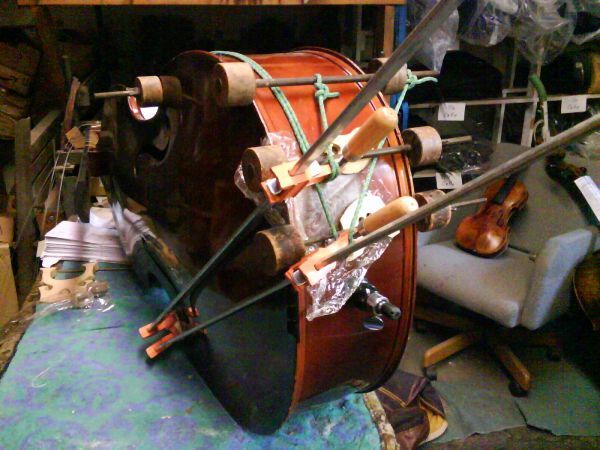 I would really need to see the bass. If they are small cracks or if they line up nicely and the ribs are thick enough, then most likely they could be glued from the outside. Large rib cracks that are just glued from the outside sometimes will not stay glued together because of weather changes and the occasional trauma of bumping the ribs. When the top is taken off, rib cracks can be glued together and reenforced so that they are basically as strong as the original rib.